My name is Dan Jorgensen and I currently serve as the evaluation and research coordinator for the State Personnel Development Grant at the Colorado Department of Education. My primary responsibilities involve the evaluation of six state initiatives including Response to Intervention, Positive Behavioral Interventions and Supports, Autism/Significant Support Needs, Early Childhood, Communities of Practice, and Family-School Partnerships. Needless to say, succeeding at this endeavor requires well-developed logistics regarding data management. 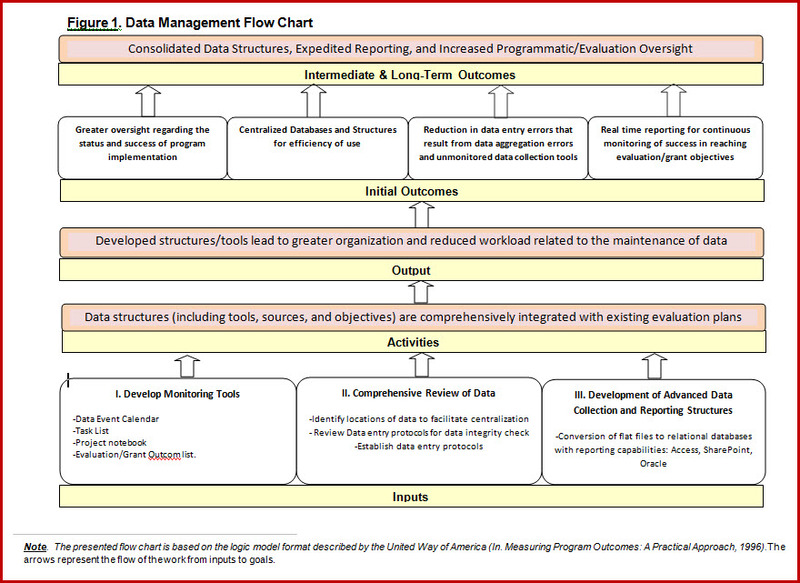 The purpose of this AEA365 contribution is to outline a simple process to facilitate the organization of new or existing data structures (see figure one). Lessons Learned: Appropriately addressing data management issues lead to more refined evaluations and analytics. In effect, time will be spent performing evaluation responsibilities as opposed to constantly organizing, reformatting, and scrubbing the data. Develop appropriate data tracking and monitoring tools. This includes, at a minimum, an event calendar with data collection and reporting deadlines; a task list to monitor day-to-day work flow and a project notebook that clearly details one’s evaluation plan and all “processes” in case the proverbial “bus” finally hits you. If you’re managing multiple initiatives and a wide range of data collections these tools are required. Extant data collection structures must be accurately located, identified, and understood. It’s possible that your data will be collected via surveys (on-line or otherwise), rubrics, state/federal data, and other sources. The collection dates, tools, stakeholders, and locations of this data must be reliably determined so management structures can be established. Determine how disparate data sources are maintained. Typically, data is maintained at a technical level based on the expertise of the “collector”. For example, field consultants responsible for data entry may only be comfortable using products such as MS-excel or MS-word. This leads to data structures being organized in a flat file format and/or creates the necessity for duplicate data entry (e.g. entry of word documents into excel). This creates a problem in that it often limits reporting options and if not organized correctly is prohibitive to relational database structures. Consolidate data to a single location and format. This allows for the gradual modification of data structures into more advanced formats and facilitates the building of reports. For example, my preference is to convert excel files to a MS-Access format with forms being created for data entry. In addition, the reporting capabilities of the MS-Access database provide both immediate and continuous feedback concerning evaluation objectives. The next step would possibly be converting existing databases to make them web-based if necessary (e.g. SharePoint). This step would be based on availability of funds and need for easily accessed data entry platforms. Thank you so much for this post! Data management is an issue that I struggle with and this is one of the first posts that I have seen that addresses the issue simply yet comprehensively!